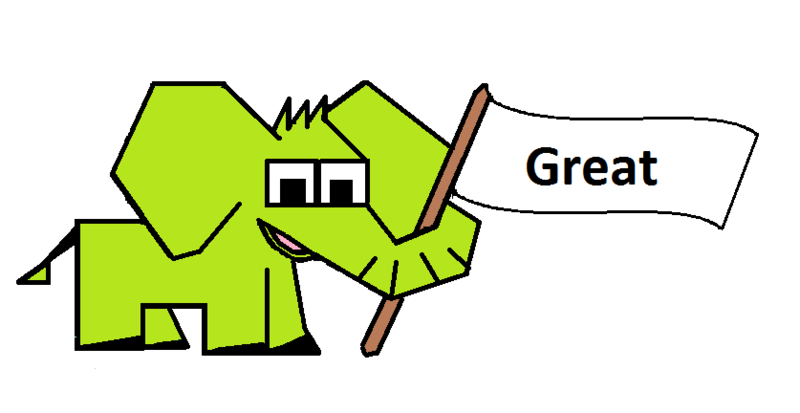 Review: Target Earth - save our green planet! It can be your friend, your neighbor, teacher or colleague. You never know, what goes through people’s heads, when they are watching TV, going out or even talking to you about last night’s football game. Each of them can be a terrorist. And then, one day, when his home cell sends a singal, he rushes off into the supermarket and puts a bomb there. Why are they doing this? They believe in something wrong. We cannot understand them, but we can surely fight them. Be vigilant and prevent them from further spreading evil. 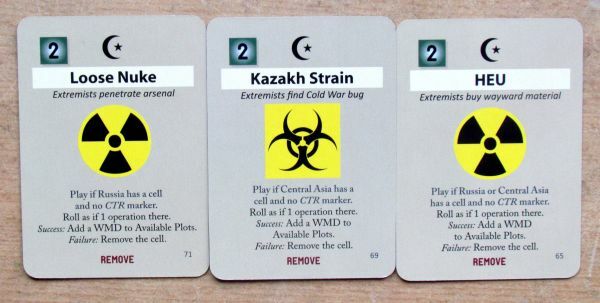 Fighting for the good and for saving human lives is waiting for you in the board game Labyrinth: The War on Terror, 2001 -? 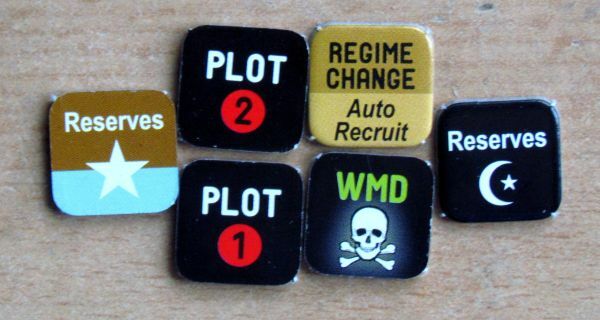 Published in 2010 by GMT Games. Its a company, which focuses mainly on the war games. Nevertheless it released such hits from other themes, like Dominant Species (review in Czech) or Urban Sprawl (review). 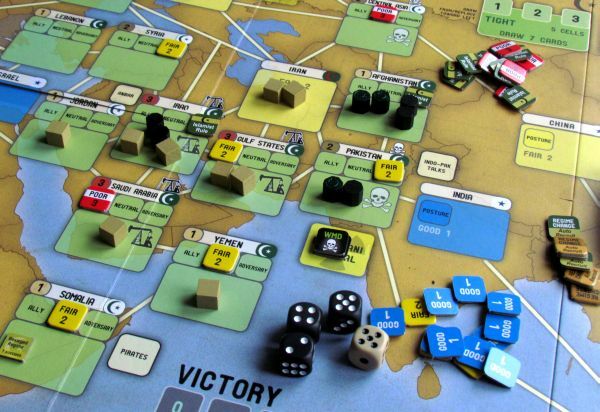 Labyrinth: The War on Terror comes from the author Volko Ruhnke, but the style is close to former games from their production – Twilight Struggle (review in Czech) or 1989: Dawn of Freedom (review), which we have talked about most recently, when it comes to GMT games. So now we return to the world of games powered by cards (card-driven games, commonly used abbreviation CDG), but in a slightly different theme. We go closer to present from the Cold War and fall of communism, to course of events, which began on 11th September 2001 and whose history ended today. Volko Ruhnke had already demonstrated his great creative instinct in the game Wilderness War, and this year issued a follower of Labyrinth, a game dealing with the Colombian crisis called Andean Abyss. 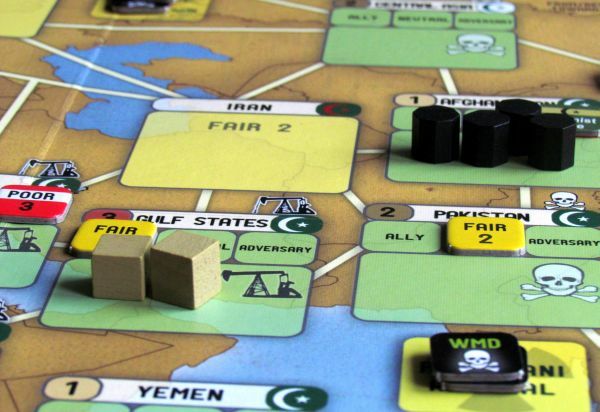 Review of this game comes up next time, so now let’s get back to today’s main topic – War on Terror. 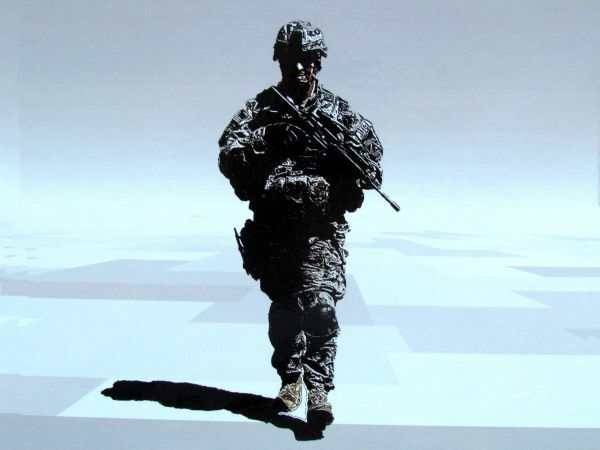 On the box, you’ll find an American soldier, striding across the chessboard. Hidden meaning is clear here, but we are interested at the moment more in weight of the whole box. We are quite sure, we know, what is the main cause of this heaviness. Its because of a massive game board, which will spread around your desk with a silent and protracted “aah”, as if it was stretching its long stiff muscles. And what lies below this map, to whose description will we return in a moment? 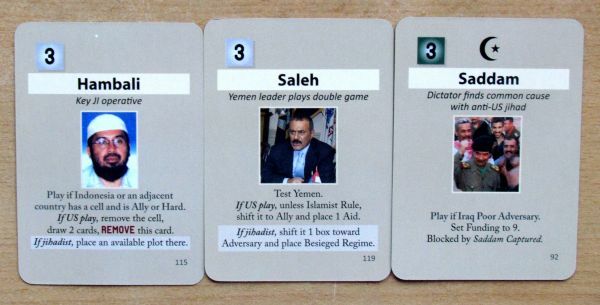 Most importantly, there are 120 cards joint for both sides and showing images and events with battle for the middle east theme. 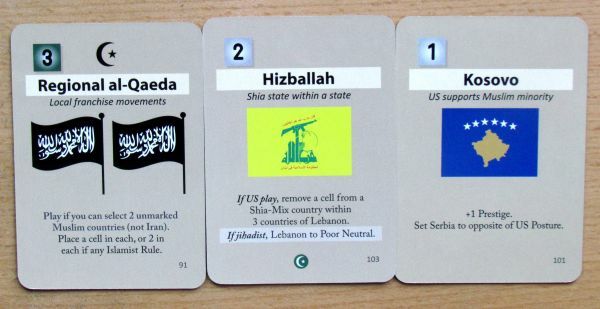 Two main sides are in the conflict in this board game, on one hand, the United States of America whose goal is to destroy terrorist cells and eliminate danger to the civilized world and secondly jihadists,who are tasked to expel intruders from their countries and restore muslim reign. 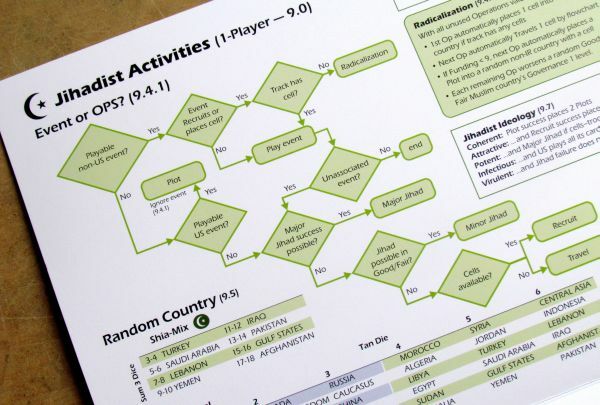 Each player will have one assistant during the game – a help sheet made of thick hard paper. 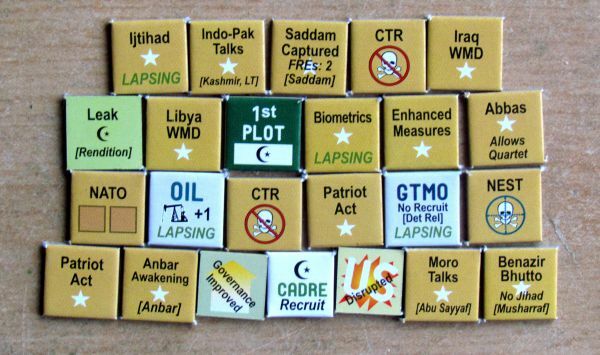 Furthermore, you’ll find four dice and fifteen wooden blocks in the box, to track the number of soldiers and also fifteen black cylinders serving as terrorist cells. 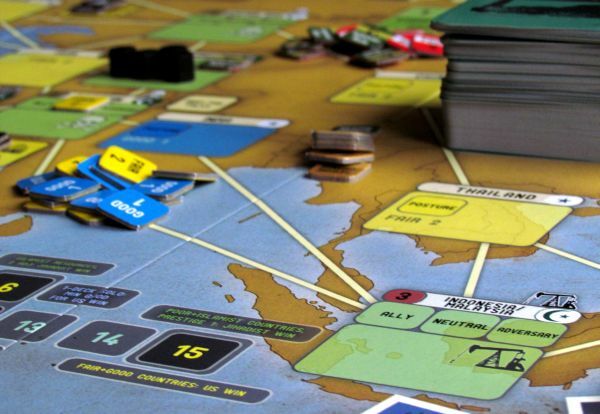 No GMT Game can exist without various types of tokens, used to indicate the status of each of the participating countries and track many other things, which need to be watched in the game. The set includes two brochures – one set of rules and one game book containing historical background and sample game description. And now we return to the map, which is the esscence of all, together with cards. Its also most difficult part to navigate during playing. There are plenty of countries, which contain several positions for tokens. The largest square at the bottom of each country will include a terrorist cell and American soldiers, but also certain additional tokens. The cells can then be dormant or active, as indicated by the cylinder rotation (one side has a green moon and stars on it). 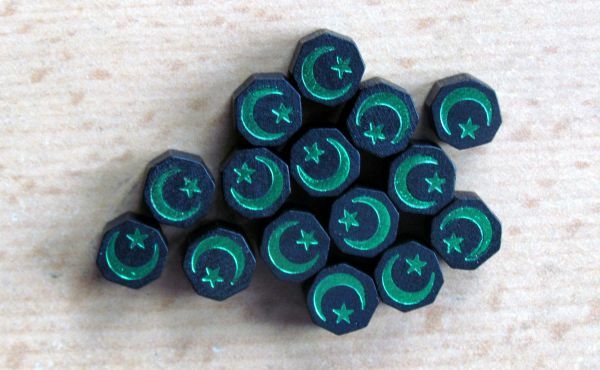 Individual states will find additional icons indicating dominant religion (important is Muslim or non-Muslim) and the number of resources, which country produces and therefore offers for financing. Each country dominated by Muslim religion also contains a scale indicating affection of this country towards the U.S. At the same time, it holds also information about the quality of the country’s government. 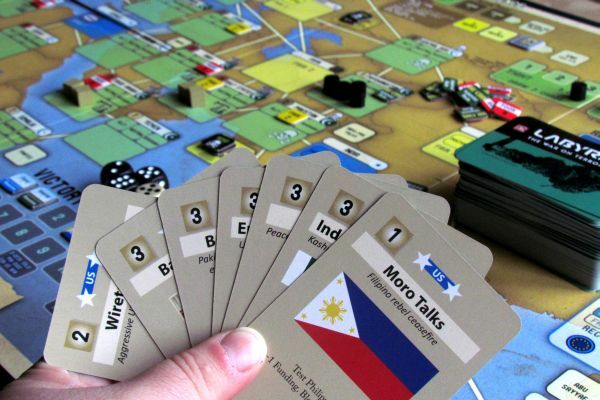 This is possible with changing colored marking tokens during a game (color – stability, position – affection), and has an impact on the progress of the game and what players actions may perform in a given country. 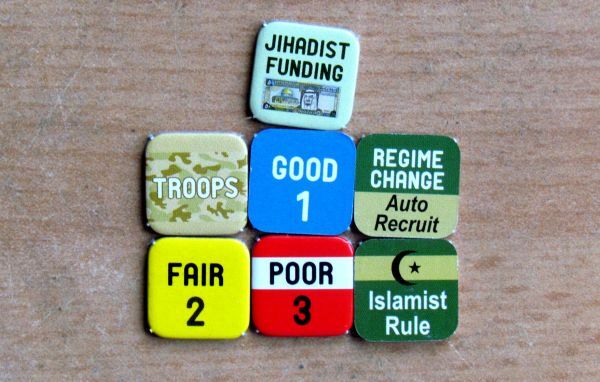 Tokens are of four types – its best to start with the GOOD blue, which leads us to POOR red and the worst ISLAMIST RULE. This token is also used to monitor the country’s attitude towards activities of the U.S. – country allignment may be allied, neutral or adversary. In contrast, countries, where is the Muslim religion in minority, have two levels regarding government attitude towards extremism – hard or soft. According to these positions, world opinion is calculated to indicate on a scale U.S. 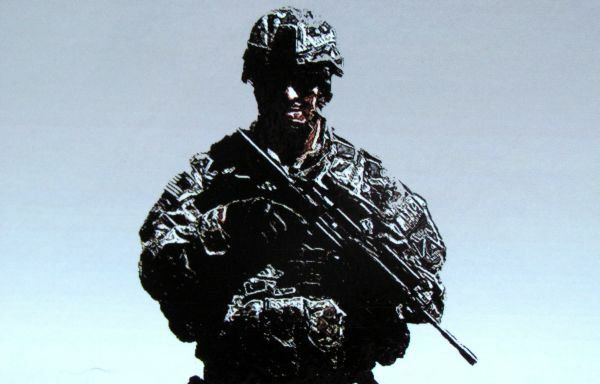 Global War on Terror (GWOT). It is important that the United States had the same position as world opinion, otherwise it waits penalty operational capabilities. Countries are connected together with lines on the map in order to clearly mark their neighborly relations (all Schengen states are contiguous and are indicated by dark blue icons of this agreement). These connections will also be important during the game. 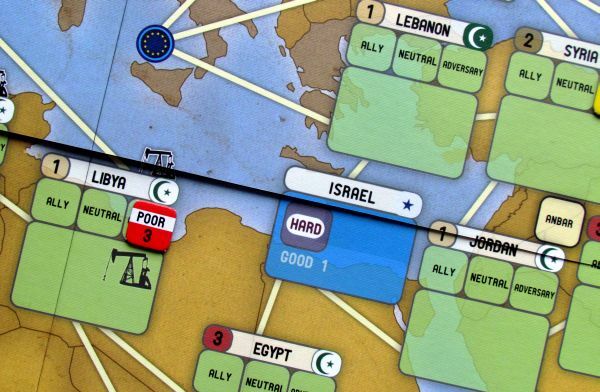 In addition to the countries themselves, you will find several different scales in the corners of the map, used to track terrorist financing, victory points or prestige of the United States. On the map, you will find also one help box, which will help you to quickly find your way in many different icons. Both players have his fifteen units located in three cells, each containing five of them. Individual cells refer to the intensity of the conflict (number of troops involved) and forces of extremism on the Jihad side. With the help of funding token, indicating financial strength of countries supporting terrorism, could you deploy cell into country. Each cell enters game as dormant and it must be activated to use it for some wicked purpose. Unlike other games, you can find several tokens on the victory points scale. They monitor progress of various situations in the game. In the game, you will encounter other chips, and we will return to some of them in a simplified description of the rules. But before we move on, we need to do one more thing. Look at one action card, and what can be found there. In the top left corner, there is number of operation points, which we already know from previous CDG games. If you play the card not as an event, but as an operation, you get few points to spend and perform a variety of activities on the board. In addition, there is a symbol on the top, classifying using card in some scenarios only. 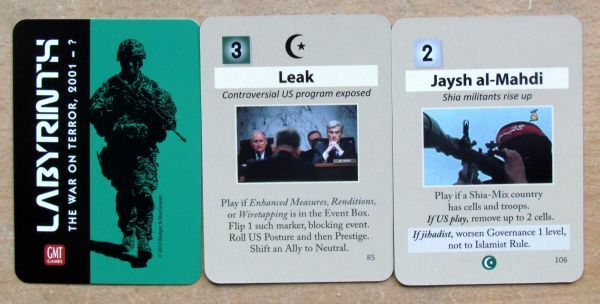 Each card is tied to either United States side, Jihad side, or is unclassified and does not contain any blue stripe or star with a crescent. There is a text describing the event the card represents and what will happen, when you play it. But in today’s review, the border between the description of components and the principle of the game is a little blurred, because the sheer description of the board and the scales told you a bit about, how the whole game will be actually played. Therefore, we will mention only a few basic principles, which drive the whole game and then we skip directly to our impressions. 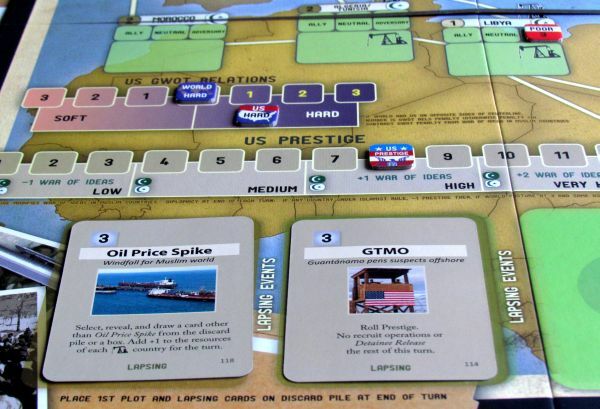 Preparation of the game is dependent on the particular scenario. 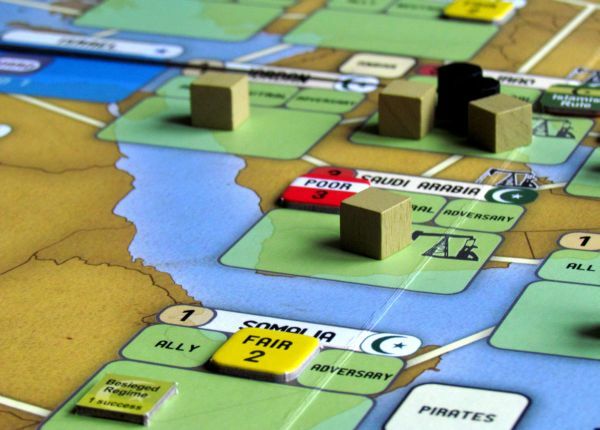 In general, the players prepare board as described in the scenario, especially in terms of countries affection for the U.S., their approach towards fighting terrorism and the quality of government. 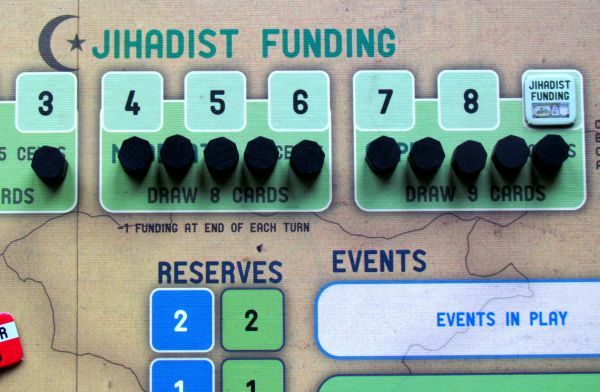 But you would also deploy troops, terrorist cells and tokens in different parts of the board. All leftover supplies are put aside, troops and cells in their place on the board. Then you shuffle a deck of cards belonging to current scenario. 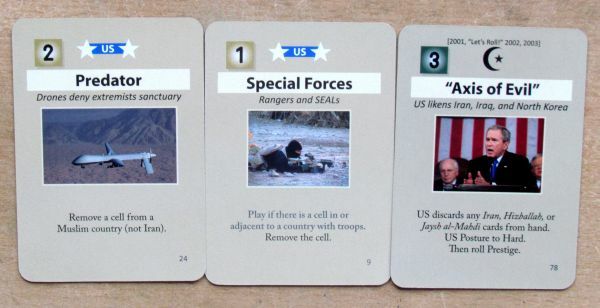 Each player gets as many cards as specified by the pointer on the scale of funding or military strength. One instruction is really interesting: Labyrinth players should sit side by side, next to each other and the map should be ahead of them. 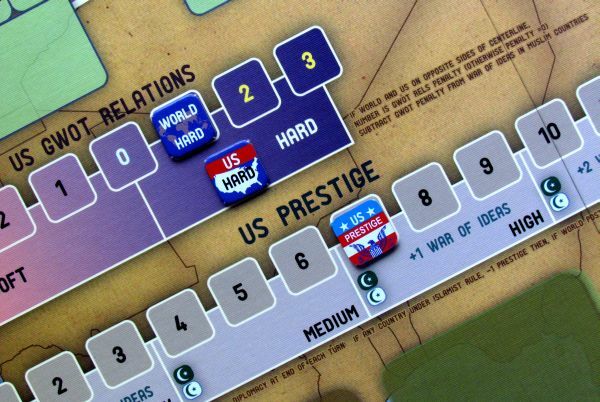 The player in the role of the United States should be to the left. This way, both have the best overview and also have easy access to all important places for their side of the conflict. The course of the game is simple. Players take turns playing cards, which they were given at the beginning of the game – always two per turn. When they run out of cards in hand, the round ends. 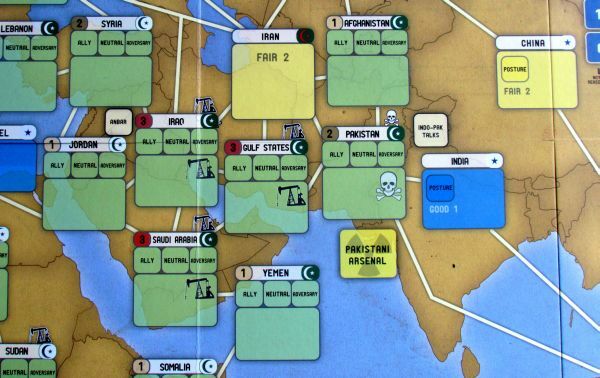 With round ending are tied some specific actions, such as reducing funding jihad and U.S. prestige. 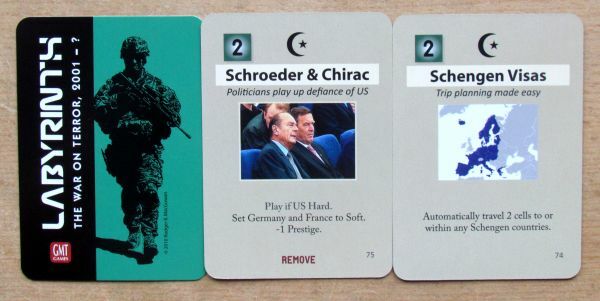 The allied player may keep the last card for the next round, play it, or throw it away. 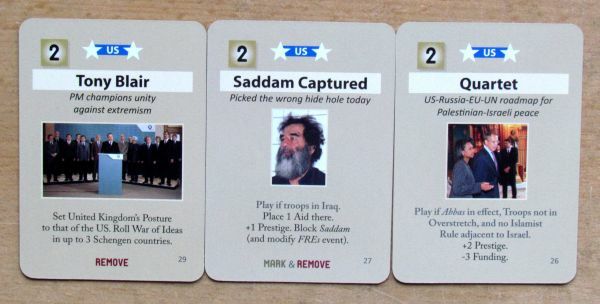 Each card can be played as an event or for operation points. But if you play the role of the United States and play a jihadist card for points, the event still would happen and the other way around too. So you can avoid only your own cards, which is needed for strategic reasons. Some events and their effects persist until end of turn, or even longer, which is easily marked with available tokens. 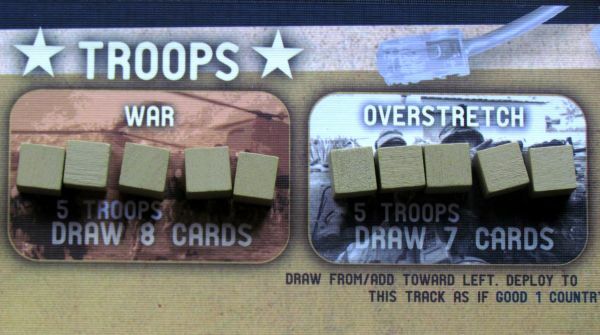 Operation points can be accumulated to prepare a large attack and mark on reserve track. For operation points, players can improve opinions in the country, send new troops in, disrupt terrorist cells and warn against extremist plans. 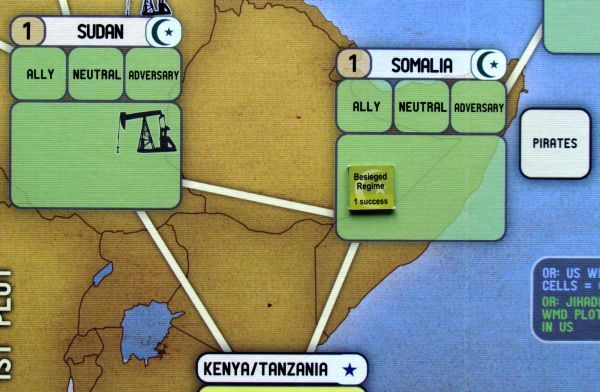 On the contrary, the Muslim player can add and move his cells, trying to change the situation in the country in his favor with guerrilla tactics or prepare malicious attacks. Each of these activities has its fixed rules, which often involve rolling dice. And this is also the most controversial place throughout the Labyrinth. The success and failure of your efforts depend often on chance. But they do in real life too, right? Match may end up in three different ways for each of the countries. 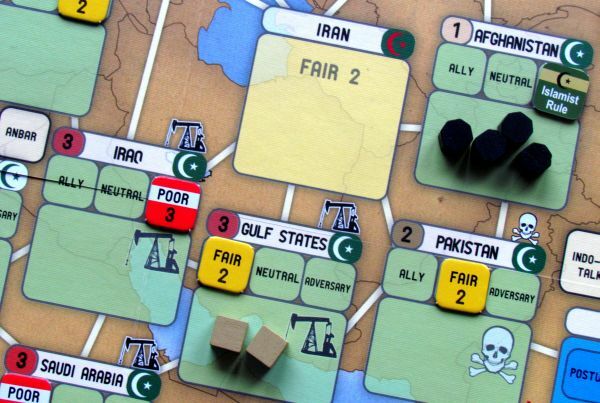 Standard U.S. win happens, when they manage to convert enough Muslim countries to government labeled good. Or they can manage to completely wipe out all jihadist cells on the map. Jihad player wins, when he sufficiently gathers several islamist rule countries, if they are able to reduce the prestige of the United States, or carry out an attack with weapons of mass destruction in the United States. The length of the game depends on how many times you want to reshuffle the event deck. There are some events, which can happen only once, but otherwise the deck is still quite thick. In the event, that no victory condition is met until then, the United States must have enough good governments in Muslim countries compared to those under Islamist rule, otherwise the bad guy wins. 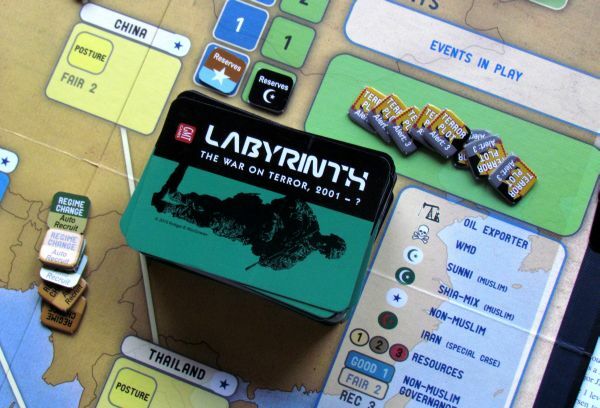 Labyrinth: The War on Terror is a game, that offers an incredibly elaborated battle for two players. The entire game contains so many different aspects and things to watch for, that you will be overwhelmed at first. You ask about complexity? 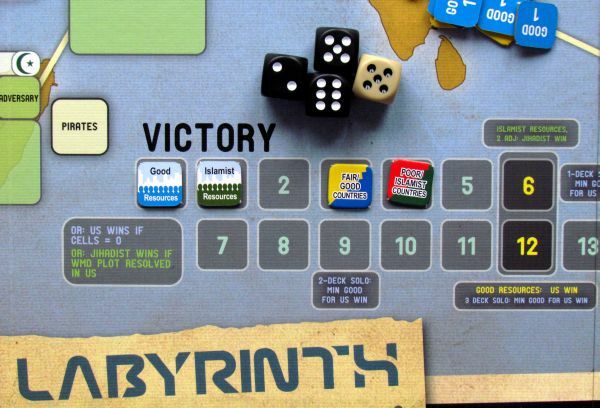 Yes, the Labyrinth is definitely more difficult and more complex, than Twilight Struggle. There are many different actions, players can perform for operation points. On the other hand, each of the sides has them clearly listed on the auxiliary card. This will help you get started quite quickly. But reward for honest learning will be an amazing and overwhelming experience. Tug of war for each country feels incredibly sophisticated and realistic. You simply enjoy every moment you spend with the game and live it, like it was real. To top it off, there is some great news, that there are several scenarios in the box. 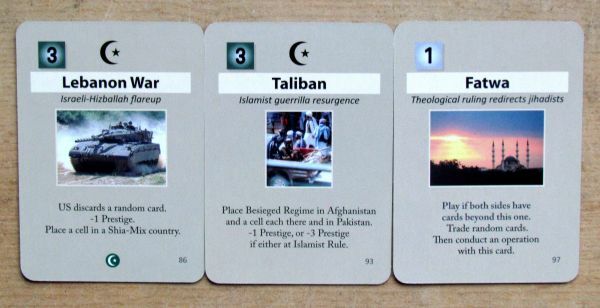 Each of them can develop quite different duel, because they revolve around different states of war on terror. There are three of them – first is response to Al-Qaeda attack in 2001 entitled Let’s Roll, Operation Anaconda (name of second scenario) followed the overthrow of the Taliban regime in Afghanistan after 2002 and the last is called Mission Accomplished? and takes place after 2003 and focuses on the situation in Iraq. Every scenario will be different, the U.S. begins with a completely different prestige, because opinion of their military actions was constantly changing in the world in these years. And so, of course, also attitudes towards their attacks are completely different. This way the map always looks totally different. Three amazing experiences, each of them will be different every time you play it and all this in one box? Unbelievable. Labyrinth is a game specially designed for two players. This makes it excellently balanced, and each side has the same chance of winning, although they need to use a different strategy. Each player has a different winning conditions, but some of them revolve around two sides of one coin. Feeling of victory in this game is really strong. Maybe you think like us – who would want to play for terrorists? But the game is really so much fun, even in their role! At least in this board game, although the topic itself is not funny at all. And that might be a problem to some sensitive individuals. The game can be played as solitaire. 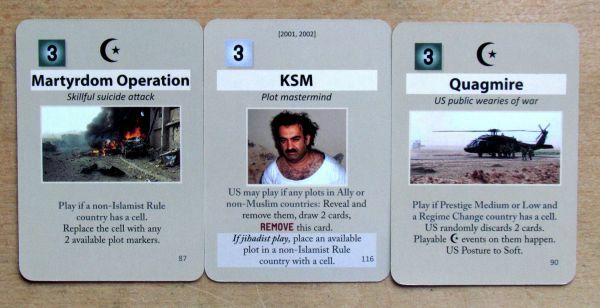 This one player will take up the role of the U.S.. Against him will be a foe, who is acting according to a flowchart. This paper governs all the reactions of this opponent. 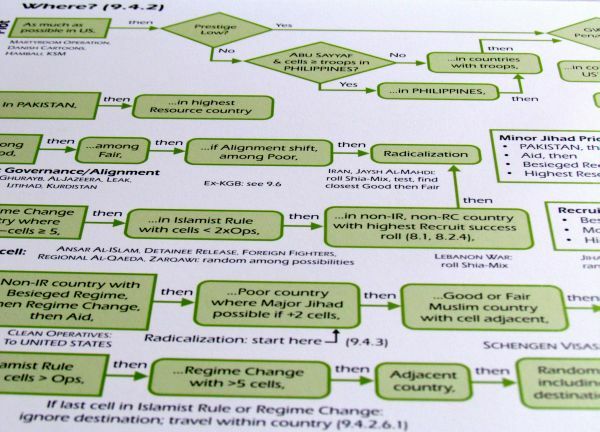 But once you learn the flowchart (and you will read it very often), you can use its flaws to create situations, which would not occur in a real game. So the solitaire game is more of a workout, that you can play a few times, but it’s certainly not a full experience comparable to a duel of two human beings. 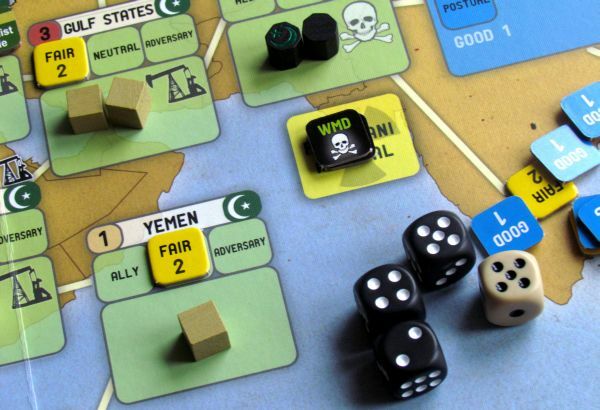 For many players the experience in the Labyrinth: War on Terror goes wrong with usage of dice. 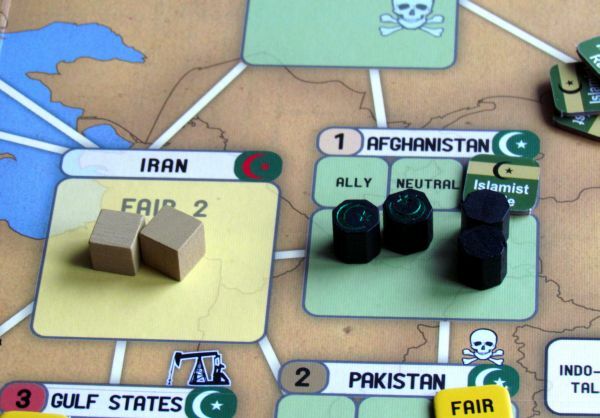 Most actions of Jihadist is associated with success in rolling dice. While this gives a feeling of success and failure, you can often get frustrated by disobedience of dice. And unfortunately coincidence has a great influence on the course of the game. 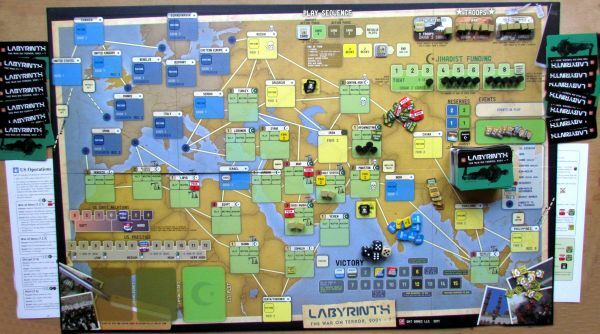 So, if you are bothered by heavy dice strategy games, then you will probably find Labyrinth unpleasing. And then there are the really dense rules. Forget 1989, this is a completely different league. A lot of small nuances, which you must not forget. The game time in first games stretches to double. However, even so, the Labyrinth game time is about two hours, which is just enough for such an elaborate game. Labyrinth is without any discussion an excellent board game, that will give you countless, amazing and unforgettable experiences. Its created around very attractive topic, where one of the players is put on the side of Muslims. Fierce battle rages until the last round, but there are plenty of ways to end the game sooner. If you do not mind using dice for decision, then you must not miss this game. Rozšíření Labyrinth: The Awakening, 2010 – ? Alternativní názvy Labirynt: Wojna z terroryzmem 2001 – ?, Labyrinth: La Guerra al Terrore 2001 – ? Labyrinth: The War on Terror 2001-? offers besides the question mark on the other side of the time span firstly lots of fun and tension. You can stop terrorism with your own strengths, or at least cut its wings a little. 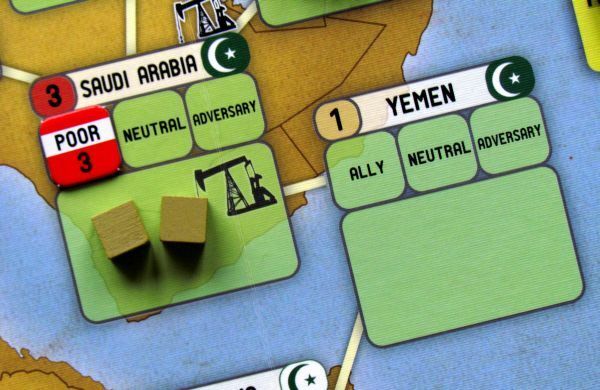 But while one player takes side of United States, the other will leads muslim to their sacred war and try to blow up a weapon of mass destruction in USA. 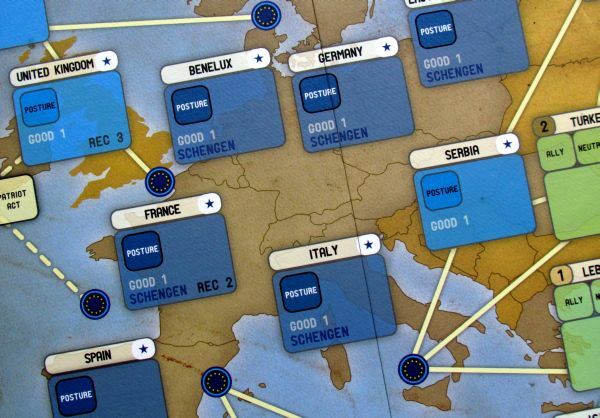 Tense board game revolves around one of three available scenarios according to historical background and you influence it by playing cards. Lots of your successes and failures is decided only with roll of the dice, which adds to the tension, but also can discourage some players from buying this game. Labyrint his quite difficult to master, given all those tiny rules, but you will be rewarded with really subtle gameplay. This board game really excels in area of atmosphere and experience enhanced by luxury board and lots of different tokens to track countries status. 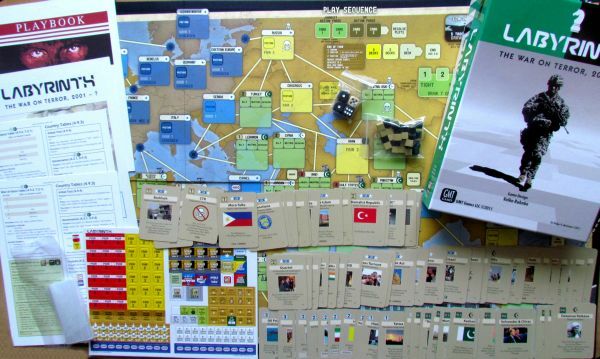 So if you are a little interested in history, terrorism or you just want to play excellently balanced game for two players, do not hesitate to buy this one! Although Dr. Bea is not a part of these mitigation teams he is receiving a large volume of copies or original suggestions. Interestingly, a versions of your "explosive plug" have been advocated to all the responsible agencies. None that I have seen is quite the same as yours. and didn’t knokw who to ask. are a professional in this subject. Well with your permission let me to grab your feed to keep updated with approaching post. oon your put up iss just spectacular and i could think you are a professional in this subject. Welll with your permission let me to grab your feed to keep updated with approaching post. The clearness on your put up is just spectacular and i could think you are a professional in this subject. keep updated wioth approaching post. Thank you a million and please continue the enjoyable work.